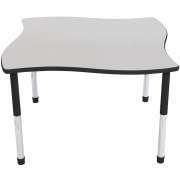 Hertz Furniture recognizes that there is more to preschool furniture than smaller sizes. How should you set up a preschool classroom? Your preschool classroom should be set up with everything from colorful classroom rugs and play furniture to a sturdy preschool tables and chairs. From playtime to naptime and everything in between, Hertz Furniture has all of the items you need to create a functional and inviting learning space. Choose from a wide range of storage options, imaginative play toys, cozy cots and more to find a winning combination that little ones will love. 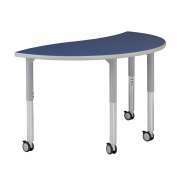 What kind of tables should you get for a preschool? 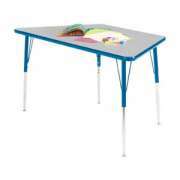 Many of the activities in a preschool take place around activity tables. 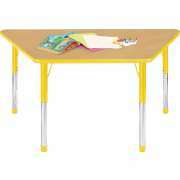 Hertz Furniture offers a huge selection of sizes, colors and styles so you can find the best preschool tables for your classroom. 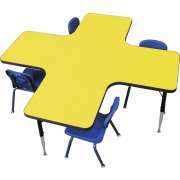 Choose from horseshoe, trapezoid, rectangle, kidney, square, circle, flower and clover shaped preschool tables. 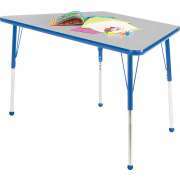 You can find toddler activity tables with matching edge banding and leg uppers, colored surfaces or vibrant ball glides. 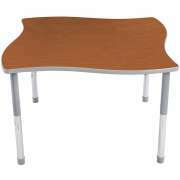 We carry models from Mahar, Academia and KFI. 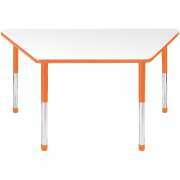 Looking for preschool tables and chairs that match? 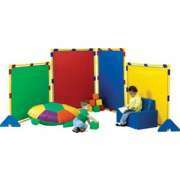 Choose from a wide variety of sizes and colors to provide a custom fit for young learners in any setting. Make sure to purchase preschool chairs that are the right height for your students. If you are looking to outfit a preschool or daycare, 10”- or 12”-high chairs are a good fit. What kind of storage do I need for my preschool classroom? 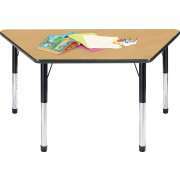 Once you have settled on a table and chairs, there are plenty of other preschool furniture items to think about if you want a classroom that ranks high on the Early Childhood Environment Rating Scale (ECERS). Shelving and cubbies are important for any classroom. 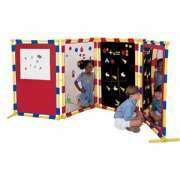 They can provide great storage for books, toys, sensory bottles, ABC tubs, art supplies and more. Open lockers or cubbies give children an easy place to keep their personal items, backpacks and jackets throughout the day. 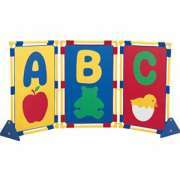 Colorful educational toys and circle time rugs can really spice up a preschool or daycare. For the youngest learners, a wide selection of Children's Factory soft-play toys can help develop both gross- and fine-motor skills. Wood Designs sand and water tables come in a variety of sizes, configurations and heights that will fit any space or age. 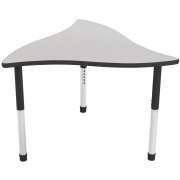 Hertz Furniture also offers many imaginative-play toys. You're probably wondering, so what should my preschool classroom look like? A preschool classroom should look like a fun and educational space. If you are looking for a way to spice-up your classroom, a colorful classroom carpet is a super choice. You can choose a classroom rug that teaches about geography, shapes, math or letters, or a design that is just for fun. We have preschool rugs from popular manufacturers such as Joy Carpets and Carpets for Kids. What kind of classroom learning centers belong in a preschool classroom? Whether you are teaching pre-k or preschool, classroom centers should be an integral part of the learning space. Some of the most common learning centers include an art area with a kids easel and lots of fun materials, a listening center and a sensory center. The dramatic play area is another popular one. It might include a store, house area, play loft, play kitchen and lots of other realistic items that encourage children to explore and use their imaginations. Center time is a great opportunity for self-directed play. If you want to encourage each student to seek out challenges and try new things every day, differentiated learning centers can be a great tool. If you are looking for a way to separate the block center, reading corner and puppet center, you can use preschool storage units, play panels or preschool room dividers. How can I make my students comfortable during preschool nap time? When playtime is over and it's time for some rest, your students can enjoy a comfortable nap time while dozing on a selection of rest cots and mats. Cots are available in a variety of sizes, some of which can be stacked for storage when it's time to play again. Foldable mats make it easy to setup or cleanup the nap area in no time. Don't forget to section-off the rest area with a curtain so sleepy children won't be distracted by what is happening in the rest of the room. Overwhelmed by all of the considerations and options for your preschool furniture? Hertz furniture is here to help you choose just the right items for your space. Whether you are just looking for an extra bookcase or you want to outfit an entire early-childhood program, you can trust that the furniture experts will offer great advice that suits your needs. 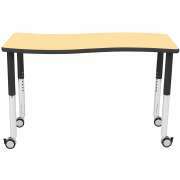 Many of our items come with extended warranties.